A leading multi-range manufacturer and distributor of food products and ingredients. Bidvest operates through strategically located independent business units, aimed at servicing the catering, hospitality, leisure, bakery, poultry, meat and food processing industries. Southern Africa performance was mixed as food deflation set in and consumers downtraded. World Cup benefits were not as strong as hoped, though volumes improved toward year-end. Hospitality industry volumes rose, but industrial catering business remained flat. Prolonged school holidays impacted the educational component of the institutional eating market. Expense management was a focus area for all businesses. Food deflation and a shrinking market intensified competitive pressure. An important benchmarking tool, the Stats SA Food and Beverage Report indicated that industry revenues fell by 1,2% over the year. Business failures only started to dip in the second half. In the leisure and hospitality sector, restaurant visits and spend per patron remained under pressure. The World Cup boosted sales in May and June, but regional effects were patchy. The restaurant and hotel markets in Gauteng appear to have enjoyed a World Cup bonanza, but in coastal areas the World Cup windfall could not offset the business impact of much lower business travel and conferencing. Low interest rates may be helping consumers to service household debt, but have not led to a consumer feel-good effect. There has been no increase in out-of-home eating. Lower inflation compounded the expense management challenge. South Africa’s return to growth was encouraging, but was not immediately reflected in the return of consumers to restaurants, coffee shops and canteens. Industry concerns in the first half of the ensuing period centre on the possibility that some consumers over-spent during the World Cup and belt-tightening may occur for several months. However, the national mood lifted considerably during and after the World Cup and the economy appears to be in recovery mode. A gradual pick-up in consumer demand is anticipated, enabling our businesses to maintain momentum. Economic performance – We are aiming for level 4 contribution under the DTI Codes, focusing on employment equity, skills development, socio-economic development and preferential procurement. Local teams are responsible for their own BEE targets and progress is tracked. We continue to support the Centre for Culinary Excellence at Johannesburg University and three aspirant chefs are being trained to improve the quality of the food preparation at the Bidfood Ingredients canteen, which is run as a business under our enterprise development programme. Environment – We track transport and have improved our measurement of all energy and resource usage. Bidfood Ingredients’ Durban yeast factory remains a challenge, being an old and environmentally inefficient facility. We continuously engage the local authority, and made the required changes to renew our annual effluent permit. Responding to growing consumer awareness and demand for sustainable seafood, we joined the South African Sustainable Seafood Initiative, and now undertake to DNA test any seafood product we can’t identify, thereby ensuring the product supplied is the same as advertised. Product responsibility – We are represented on the South African Food Safety Initiative, a subcommittee of the Consumer Goods Council of South Africa. New labelling legislation will be effective from March 2011, and we expect more thorough policing in future in line with international standards. We expect to gain competitive advantage in this new operating environment, leveraging off the leading standards we set for the industry. Human resources – Employee engagement is decentralised, with issues raised and dealt with immediately. Despite strong labour representation, relations are constructive and no strike action was experienced. First priority for employees is skills training and advancement – possible now that the long-time barrier of a lack of basic lifeskills has largely been overcome through recruitment of employees that at least complete their final high school exams. In addition to our internal training, we have an active learnership programme in partnership with the food and beverage and wholesale and retail training authority. Talent retention remains a challenge. Staff developed by an industry leader rapidly become the target for recruitment by competitors while emigration continues to put strain on the skills base. Health and safety – Critical aspects of health and safety management, such as audits, are outsourced to specialist consultants. Spot-checks are conducted and a full incident report serves as a guide for improving systems and closing loopholes. There were again no fatalities across our businesses. 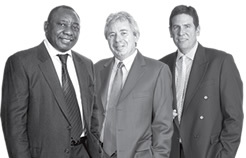 Labour disputes – CCMA cases brought against Bidvest Foodservice Southern Africa rose 13% to 71, with 48 findings in favour of the division. No Department of Labour fines were incurred for non-compliance. Trading profit was flat, despite an excellent fourth quarter. We derived competitive advantage from our position as the supplier offering the widest range of products in our industry. We grew market share and the basket of supplied products despite a shrinking customer-base. Customers achieved operational and price efficiencies by pooling their buying with a broadline supplier able to meet diverse needs in one drop. Margins suffered as a result of our market-share drive, though aggressive management of growth and advertising rebates enabled us to make up the loss. The need for increased World Cup working capital pushed funds employed higher. Cash generation was good. We cut petrol and diesel usage and increased the amount of waste we recycled. Credit management was rigorous. Sales teams increased the business written with customers in good standing and aggressively pursued new business. The average value per invoice increased by 4%. To support this effort we introduced a field sales management tool that enables sales teams to more efficiently manage sales and call cycles. Expenses were well contained, despite additional rental and depreciation costs following four branch relocations. Stock losses and bad debts fell. Delivery costs fell 5,7% and the size of the vehicle fleet was reduced by 6%. We renewed the fleet ahead of the World Cup and disposed of less efficient vehicles. Our value proposition as a solution-finder was showcased by our national accounts business. We offer national customers a central point of contact for central price negotiations against a nationally distributed supply solution. Greater efficiencies allowed us to reduce our gross margin, grow volumes and maintain our operating margin in this channel. We grew our export business, especially to Angola and acquired a small catering equipment business, Caternet. In 2011 we plan to build a new multi-temp facility in Bloemfontein and convert our Polokwane frozen facility to multi-temp. Improved infrastructure will add much-needed capacity in both regions. The business is well positioned to seek renewed growth as economic conditions improve. Bidfood Ingredients put in a pleasing performance in challenging conditions, impacted by lower commodity product volumes and deflation. Revenue dipped, but trading profit showed pleasing growth. We maintained investment in skills development. Management initiated a strong drive to reduce our carbon footprint. A process of target-setting, quarterly monitoring and regular reviews was established. We have begun to benchmark our use of electricity, water and fuel. Effluent discharges are closely monitored. Our food safety programme was stepped up. We have begun educating personnel in the principles of basic food safety at all branches. Our Cape Town savoury ingredients factory achieved ISO 22000 accreditation. Customers were impacted by consumer cost-cutting. Consumption of meat and poultry fell. We introduced offerings to help food manufacturers develop more affordable options. Sales of some commodity products fell. We reduced stock, though inventory rose near year-end to optimise the World Cup opportunity. Cash flows strengthened. Chipkins Bakery Group maintained its improvement and continued the development of its own manufactured lines. NCP Yeast was impacted by a shortage of local molasses. Even so, the business performed well. The Crown National launch of its Chef’s Choice range proved highly successful. We also introduced the Handipack retail spice range. Bidfood Solutions, our vehicle for increased penetration of the general foods sector, faced a challenge as some large customers froze new product development. We launched promotional drives to maximise sales over the World Cup and obtained exclusive rights to the word “vuvuzela” in the spices and seasoning segment. A new warehouse management system was implemented at Crown National’s Cape Town spice factory. In the coming year, we plan further growth in sales and profitability while achieving continued efficiencies. South Africa’s leading distributor of local and imported food brands achieved record revenue and trading profit on the back of a good second half. The business benefited from increased in-home eating and a high in-store presence. Several new products were introduced while the Goldcrest range was expanded. A major drive to reduce the incidence of damaged returns and better stock rotation led to margin improvement. Stock levels rose for the World Cup, but over the year as a whole inventory was tightly controlled. Debtors management improved, as did cash flows. We made increased use of automotive telematics and began a concerted drive to improve collation and interpretation of sustainability data. Efficiencies in power and fuel usage will be aggressively pursued. Own brands were strongly promoted. Softer prices on some lines and a stable rand enabled us to partner major retail groups with aggressive promotions. In the final quarter, we stocked up on lines for in-home consumption during shared viewing of World Cup games. We began a logistics partnership with Ferrero, the leading imported confectionary brand. The relationship facilitates entry into markets such as garage stores and pharmacies while broadening retail chain exposure. Trading conditions are expected to remain challenging, but we will seek continued revenue and profit growth.